Whether you’re reading in your native language or learning a foreign language, there are plenty of times when a little extra help would be welcome. What if you run across a word that you just don’t know the meaning of? Or what if you know what it means and how to use it, but aren’t sure how to pronounce it? Usually you’d either dig out the dictionary, turn to Wikipedia, or try to find an audio file online that would tell you how to pronounce the mystery word. But stopping to do any of those things can break the rhythm of your reading and cause you to lose concentration. What if you had the answer right at your fingertips? 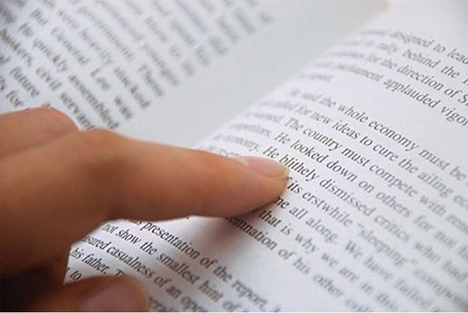 Touch Hear, a futuristic concept from the National University of Singapore, would allow users to simply touch a printed word to hear its meaning and pronunciation whispered in their ears. 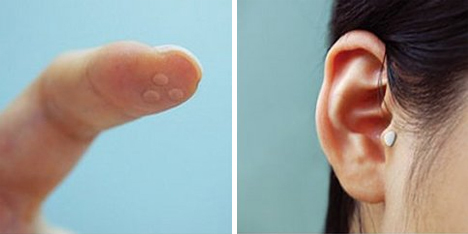 An implanted device in the fingertip would recognize the characters, and another device implanted in the ear would audibly relay the information. Word-recognition devices are nothing new, but to date people have mostly shied away from having unnecessary things implanted in them. Is it possible? Absolutely. Will it ever happen? Probably not. But if the concept is ever realized with pieces that can be removed at will, it will almost definitely be a huge hit. This may also be a viable alternative to braille or books on tape for blind readers, though a wireless processing unit would probably need to be a part of the setup. See more in Cybernetics or under Technology. October, 2009.